…and died of cancer. At 57. Life is cruel and unfair. But man, she lived one heck of life in that time. Setting marathon records and even having a race named for her, one just for women. Women athletes found it hard to get ahead at the time but she forged her own path. Women are where they are because people like Waitz blazed ahead to make a way where there wasn’t one. 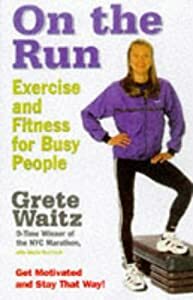 Learning of her death has actually made me resolve to stick to the 10-week plan she outlines in her book “On the Run: Exercise and Fitness for Busy People”. The goal of the plan is to gradually work up to running 3 miles or roughly 5km at a time. To be honest, I hate running. Hate, hate, hate. Growing up, I was sickly and badly anemic, easily winded and found running a painful ordeal. But I did have one exception, though. Running on the grass in the early morning just before dawn – that I loved. The feel of grass under my feet, the cool air, the slow arrival of light; there’s a kind of magic for me there that I don’t feel at any other time, in any other place. But I’d finished up to 3 weeks of Grete’s program before real life got in the way and had dropped weight fairly quickly to 57kg from 61. That was of course along with severe diet modifications. My goal is simple: to finish Grete’s program. After that, well, we’ll see. I’m not the type who’s keen on marathons and runs as am quite claustrophobic. What I want right now is to get fit after an appallingly sedentary lifestyle for the past six months. And the fitness update, as always. Wearing the boots from hell – tight boots that required a lot of effort to walk in the 8 mins from home and back.